Godefroy Brauer [1857-1923], Paris and Nice; purchased 1907 by J.P. Morgan [1837-1913], New York, until at least 1923; (M. Knoedler & Co., New York); purchased January 1935 by Andrew W. Mellon, Pittsburgh and Washington, D.C.; deeded 1 May 1937 to The A.W. Mellon Educational and Charitable Trust, Pittsburgh; gift 1937 to NGA. Belle de Costa Greene of the J.P. Morgan Gallery stated in a letter dated 22 January 1940 that Morgan bought the work from "G. Brauer," most likely the dealer and collector Godefroy Brauer. Provenance prior to Andrew Mellon is according to a letter from the Pierpont Morgan Library, in NGA curatorial files, which indicates the work may have come from the Hainauer Collection. From 1907-1916 the work was on loan to The Metropolitan Museum of Art, as indicated in the Bulletin of the Metropolitan Museum of Art, vol. II, 1907. A letter dated 22 January 1948 from M. Knoedler & Company, in NGA curatorial files, states that in 1916 the work was relocated to the Morgan Library. Morgan lent the sculpture to The Metropolitan Loan Exhibition of Arts in the Italian Renaissance in 1923. The 1940 letter (see note 1) states that Morgan sold the work to Mellon through Knoedler & Company. On loan to The Metropolitan Museum of Art, New York, 1907-1916. Loan Exhibition of the Arts of the Italian Renaissance, The Metropolitan Museum of Art, New York, 1923, no.48. Preliminary Catalogue of Paintings and Sculpture. National Gallery of Art, Washington, 1941: 217, no. A-5. Book of Illustrations. National Gallery of Art, Washington, 1942: 253, repro. 223. Swarzenski, Georg. "Some Aspects of Italian Renaissance Sculpture in the National Gallery." Gazette des Beaux-Arts 6th series, 24 (September 1943): 150 fig. 1, as by Agostino di Duccio. Paintings and Sculpture from the Mellon Collection. National Gallery of Art, Washington, 1949 (reprinted 1953 and 1958): 154, repro. Seymour, Charles. Masterpieces of Sculpture from the National Gallery of Art. Washington and New York, 1949: 177, note 25, repro. 91-94. Finley, David Edward. A Standard of Excellence: Andrew W. Mellon Founds the National Gallery of Art at Washington. Washington, 1973: 38, 39 repro. Sculpture: An Illustrated Catalogue. National Gallery of Art, Washington, 1994: 20, repro. Johnson, Geraldine A. "Art or artifact? 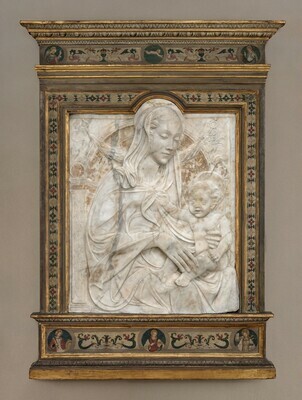 Madonna and Child reliefs in the early Renaissance." In The Sculpted Object 1400-1700. Aldershot, England and Brookfield, Vermont, 1997: 5, 15 n. 25. Catterson, Lynn. "Stefano Bardini and the Taxonomic Branding of Marketplace Style: From the Gallery of a Dealer to the Institutional Canon." In Eva-Maria Troelenberg and Melania Savino, eds. Images of the Art Museum. Connecting Gaze and Discourse in the History of Museology. Berlin and Boston, 2017: 45-48, 46 fig. 2. Dickerson III, C.D. "The Sculpture Collection: Shaping a Vision, Expanding a Legacy." National Gallery of Art Bulletin 56 (Spring 2017): 2-3, repro.